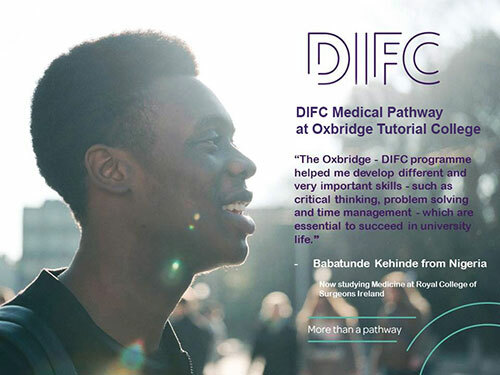 The DIFC Medical Pathway is a one year programme modelled after a foundation programme, offering more choice of destinations and catering to a wider range of abilities and budgets. Overall it is a more flexible programme catering to a wider audience. MP2 entails one semester at Oxbridge Tutorial College in Lagos and 2 semesters at The Dublin International Foundation College (DIFC) in Ireland. DIFC is a specialist foundation college based in Dublin (Ireland). Established in 1999 and has gained the reputation of offering quality programmes and second to none support and guidance to students. This pathway is the perfect complement to our more demanding and rigorous Bellerbys Medical Pathway Programme. Age Restrictions – Students must be 17 years or older by the time they continue with the programme in Dublin. Why not watch the video testimonial of our first set of DIFC Pathway Programme students whilst they were undertaking the second phase of their studies in Ireland. They have all now been admitted onto the medical degree programme at the Royal College of Surgeons in Ireland. Testament to the quality and success of the programme. The Bellerbys Medical Pathway is a two-year programme modelled after a traditional 2 year A level and is intended for the brightest and the best students. Achieving a place at one of the UK’s top medical schools is an arduous process. It is extremely competitive with thousands of UK and international students applying for a handful of places. As a result we have designed this programme, in conjunction with Bellerbys UK, as a pathway offering local students the greatest chance of achieving one of these coveted places. MP1 is best suited to the strongest students with ambitions of achieving a place at one of the UK’s best Medical Schools. MP1 is a two year programme. Year 1 is undertaken at Oxbridge in Lagos. Upon successful completion of the first year of this programme students then progress on to Bellerbys to undertake their second year of study and application to the medical school of their choice. The relationship between Oxbridge and Bellerbys was fostered specifically to develop this medical pathway and it is the ambition of both institutions to offer students as seamless and rewarding a pathway as possible. Bellerbys College is one of the UK’s leading specialist sixth form colleges. They have been preparing students for UK university for over 50 years with constantly improving results and facilities. Bellerbys has campuses in London, Brighton, Oxford and Cambridge with Cambridge specialising in the sciences and as such being the destination for students from this pathway. Oxbridge Tutorial’s teaching and facilities are amongst the very best in Nigeria and they continue to strive for innovative new practices to ensure they remain ahead of the competition. Our decision has been justified by the success of our daughter at the University of Leeds where she made a First Class (Honours) in Electronics and Communications Engineering, and subsequently earned a Masters in Petroleum Engineering from Imperial College, London. This is a school one can go to sleep soundly and entrust your children’s academics into qualified hands of competent teachers.